All traffic will flow in the same direction. The flow of direction is east to west. 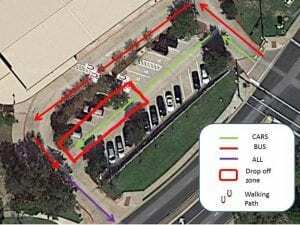 Upon entering the east driveway, buses will form a single-file line on the right, and continue east to west in the lower portion of the parking lot, nearest the bus canopy. 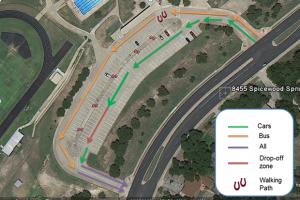 Upon entering the east driveway, cars will form a single-file line on the left, and continue east to west in the upper portion of the parking lot, nearest Spicewood Springs Rd. Cars will continue in a single-file line, pulling up as far as possible before stopping for students to exit the car. Students will exit the car, preferably on the right. Students will exit the car, and walk along the median toward the school building. Students will cross the bus lane at the designated crosswalk at the bus canopy. 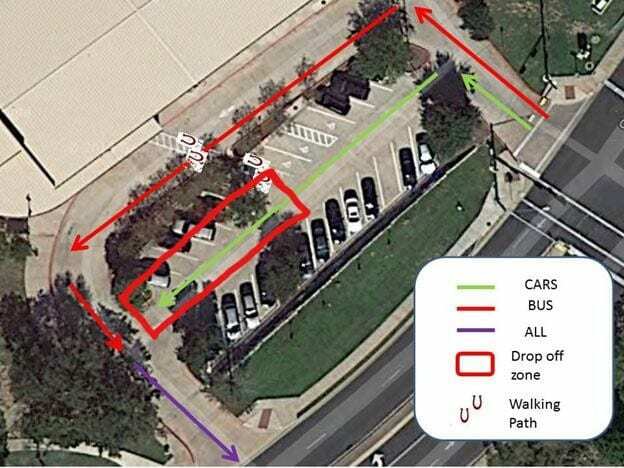 Once students have exited the car, drivers may pull out of the west driveway, using either the right or left side, depending upon which way they are turning. 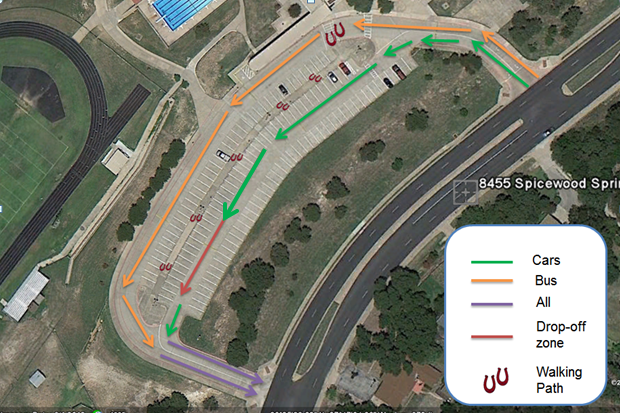 The small parking lot is for visitor/parent parking during the school day, and for student drop-off before school. Upon entering the east driveway, at the light at Yaupon, buses will proceed to the lower portion of the parking lot, nearest the school. Upon entering the east driveway, at the light at Yaupon, cars will proceed to the upper portion of the parking lot, nearest Spicewood Springs Rd. Students will exit the car, and cross the bus lane at the designated crosswalk. Once students have exited the car, drivers may pull out of the west driveway. As always, courteous and safe driving behavior is expected to make any parking lot procedure work well. This procedure is in place regardless of the time of day. Please adhere to this flow of traffic whether you are dropping off early in the morning, or picking up late in the afternoon. Please do not ever drop off your child along Spicewood Springs Rd. This creates a very unsafe situation for your child, and other drivers. Lastly, we will monitor this procedure in the first few weeks of school, and will communicate any adjustments that need to be made.